A pet parent wondering what to do with your puppy poo while you’re away on holiday or even at work? Fret not. SwearOnDog.in, touted to be India’s first startup for dog boarding facility, is right here to help you out. Started by a group of pet lovers who thought to themselves “why should humans have all the fun?”, SwearOnDog.in is touted as India’s first startup on pet boarding that ensures your pet has a great holiday while you’re out there on yours. This place has everything your little doggo could need. Each boarding facility is fitted with an LCD screen and has a sprinkler system installed so that it never gets too hot, ensuring your pet’s comfort. Along with a dog spa and salon and a pet limousine service, your pooch will be living it up in luxury and receive attention and care. These guys also have a day care facility for your pet, where the pooch will get the right amount of exercise, mental stimulation, and find friends in both the dogs and the people here. Let your fur ball run along in their large outdoor yards and get some fresh air, instead of locking him up at home while you’re away at work. This place is open all week from 8 am to 7 pm. A day’s boarding will cost you INR 499. From a pet cab that will pick up and drop your pet back home to certified grooming at their dog spa and salon, these guys offer quite the range of pet-related services. Grooming services start at INR 499 and go up to INR 2,000 depending on how many of them you avail. Rocky’s birthday’s coming up? Celebrate it here with all the other dogs. The scale of the party depends on how much you are willing to shell out. 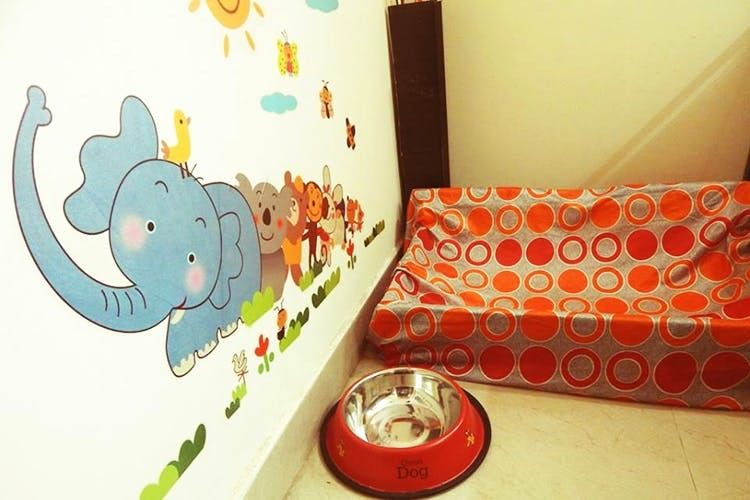 Their prices to host your doggie’s birthday bash start at a reasonable INR 600. Oh! And did we mention that these guys have a splash pool for the pups to play around in. Yep! This is what puppy heaven looks like. They also conduct dog therapy sessions to make sure your pooch is doing good on the emotional and social front, and to strengthen the human-pet bond you both share.